Cystinuria remains a challenge worldwide for urologists. Over the last 5 years we have introduced a multidisciplinary clinic for our cystinuria patients and as part of that, patients have an opportunity to see a dietician on every clinic visit. This innovation has been well received by our patients with a focus on a diet with low intake of the cystine precursor methionine as well as a ‘healthy stone diet’ with low salt, high fluid etc. “But in practice, what does this mean I can eat?” many of our patients ask, accustomed to Western high animal protein diets. To help them with this we have advice on the website cystinuriaUK.co.uk and produced a cookbook entitled ‘Lose a Stone’ with recipe ideas from staff, patients and contributions from Lawrence Keogh, then chef at Roast Restaurant located in Borough market along with pictures from Turnips the fruit and veg stall there. A second book, ‘A Stone’s Throw to Health’, is due to be published soon. 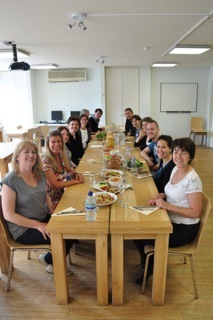 To further encourage our patients we had the novel idea of running a cookery workshop for them and the first one was held in June 2014 at Leiths School of Food and Wine in London. Leiths has an international reputation as a first class culinary institute for chefs and our group were abuzz with excitement at the thought of cooking at such an establishment. Having worked hard in the kitchen, the participants were then able to sit down and enjoy the fruits of their labour with a glass of fruit and vegetable smoothie, specially prepared for them by Cee. 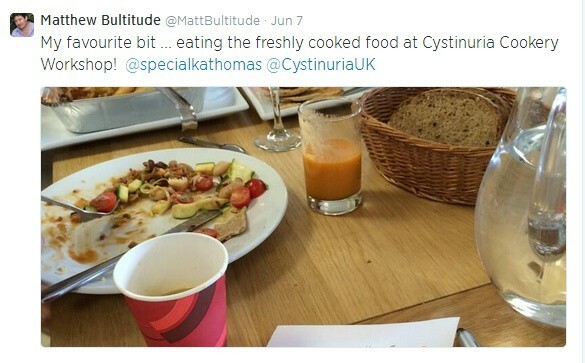 The events were inevitably posted out on Twitter with Matthew Bultitude admitting that eating the food was what he really came for! The workshop was well received by all those that attended, even those whose previous culinary expertise stretched to baked beans on toast! We even saw changes to some ingrained dietary habits – one of our patients hadn’t had a tomato since the 1960’s having been advised to avoid seeds of any description for fear they would form stones. Thanks to the recipes and the workshop he now feels able to reintroduce other foods with seeds into his diet – think of all the extra anti-oxidants he’ll be getting! Another patient had been adamant that he didn’t like any beans except baked beans. As he was tucking in to and enjoying the vegetable paté that Cee had prepared, he was reminded that there were kidney beans it! Overall, the day was a huge success and very much enjoyed by all (including the medical staff!). Hopefully new recipes have been learnt, bad habits removed and an appreciation gained that healthy food can still be tasty! New friends were even made amongst a group of patients who rarely meet another sufferer given the rarity of the disease. Plans are already underway for a second course later on in the year. We wish to acknowledge GSTT Charity, who gave financial support. This was a fantastic day. I consider myself a reasonable cook and am a firm believer that this diet has improved my condition. However at times I struggle to find inspiration and quick easy recipes. The food was amazing. I have made so.e of the recipes at home and experimented with variations. It was great to meet with other people who share the condition and my passion for cooking has been reignited. A big thank you to Kay, Angela and Matthew for arranging it and also to e everyone at Leiths who looked after us so well. Many thanks to Kay and Angela for organising such a useful workshop. It can be quite hard work making tasty food with a low animal protein and low salt diet, but going through the recipes with Cee served as an inspiration for the way to approach making food for this kind of diet. My kitchen cupboard is now stocked with more herbs and spices, and the window sill even sports pots of herbs; if only I could keep the parsley from wilting! I have used many of the recipes from the first recipe book, and look forward to the second edition. Overall, along with the patient conference earlier this year and the all-in-one clinics, the level of care for cystinuria patients at Guy's is frankly amazing. Since having being diagnosed with Cystinuria I've had to change many things, but mainly the diet. Salt was instantly off the menu and an increase in my fluid intake, was on every course. Over the years, and with the help of Kay, Angela and Matthew and the clinical staff at The Stone Unit, I've been able to manage my condition and be stone free for the past three years.....so a BIG THANK YOU! The cookery course at Leith's was yet another example of gaining information and more knowledge about managing (or abating) the stones under the guidance of GSTT. The course was hugely enjoyable and provided me with four new recipes to try, a couple of which have already been included in my repertoire at home. The lesson in to how to cut an onion 'professionally', is something that I've been boasting about to my family and friends too! 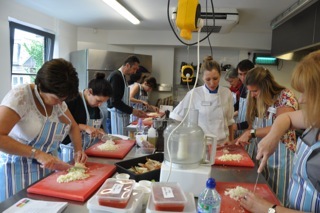 To mix with fellow patients on the cookery course was also good way to share experiences whilst having fun. Thanks again for an enjoyable day, let's hope that the second course is only a stone's throw away! !